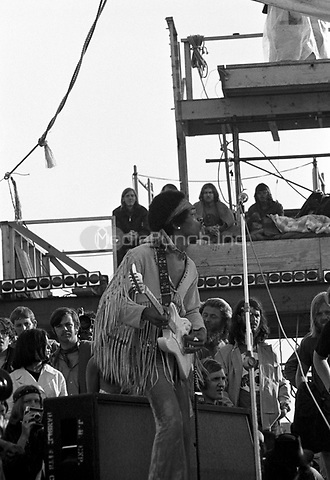 Jimi Hendrix performing his legendary 2 hour performance at Woodstock Music & Arts Festival held on Sam Yasgur's alfalfa field in Sullivan County in Bethal, New York on August 18, 1969. Hendrix insisted he close the festival and was scheduled to appear at midnight but due to delays did not take the stage until 9 a.m. Monday morning. Most of the crowd had left for home by then and had dwindled from a whopping 500,000 to measly 80,000.